Republican presidential candidate Newt Gingrich said the U.S. should look at returning to the gold standard. NEW YORK (CNNMoney) -- Republican presidential candidate Newt Gingrich is calling for the United States to think about returning to the gold standard. Speaking at a foreign policy forum in South Carolina on Tuesday, Gingrich advocated a "commission on gold to look at the whole concept of how do we get back to hard money." Gingrich, a former Speaker of the House, has spoken in favor of a "hard money" policy in the past, but these were his strongest comments to support reinstating the gold standard. Gingrich would model his "gold commission" after one put in place after Ronald Reagan was elected, when the nation was battling double-digit inflation. But even then, the commission overwhelmingly rejected the idea of a return to the gold standard. One of only two members of the 17-member commission to endorse a return to the gold standard was Ron Paul, one of Gingrich's rivals for the GOP nomination. The United States first moved away from the gold standard, under which the dollar was backed by the nation's gold reserves, in 1933, and dropped it altogether in 1971. Despite support for its return by some on the political right, few mainstream economists support its reinstatement. Chief among the problems is that with a dollar pegged to gold, U.S. goods could become uncompetitive on the global markets compared to goods priced in euros or yen. The return to a gold standard is a central point in the campaign of Paul, a Congressman from Texas who also advocates abolishing the Federal Reserve. In his comments Tuesday, Gingrich also spoke sharply against the Fed, saying it should focus on keeping prices in check, dropping the dual mandate of job growth and fighting inflation. "We need to say to the Federal Reserve: Your only job is to maintain the stability of the dollar because we want a dollar to be worth thirty years from now what it is worth now," he said. "Hard money is a discipline. It means you can't inflate away your difficulties." 0:00 / 1:46 Gold shines. Oil gushes. Uh oh. The Fed has become a major target of Republicans in the last year. Republican congressional leaders wrote to the Fed in September asking it to not take any additional steps to help spur the economy. 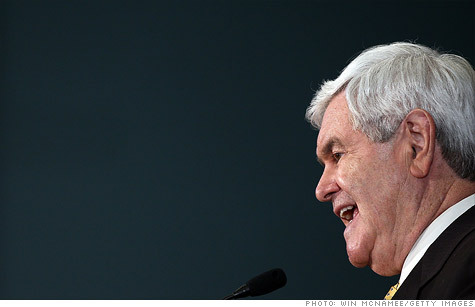 Other leading Republicans have echoed Gingrich's call to end the Fed's dual mandate. Texas Gov. Rick Perry, another presidential candidate, even suggested Fed Chairman Ben Bernanke might be guilty of treason if the Fed moved to buy more Treasuries in an attempt to spur greater growth. Gold shines. Oil gushes. Oh oh.